It’s that time of the month again (har, har). We only have one more full month of summer…what happened? 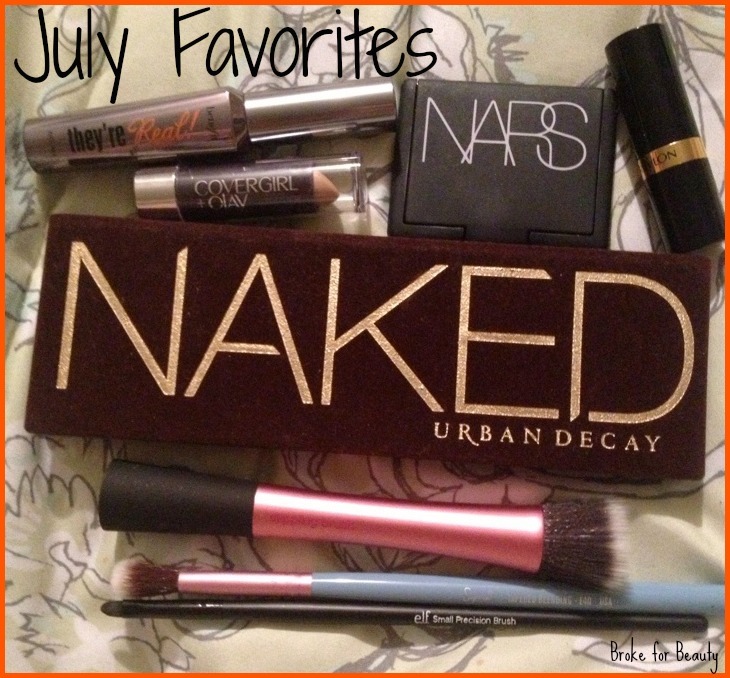 Anyway, I have some favorites of the month to show you! I know, I totally hated this when I first got it. I thought it looked chalky and didn’t do a great job covering my dark circles. BUT, I think maybe it just needed to be worn in a little, because I brought this on my trip to LA and really started to like it. The more I use it, the more natural it looks. I have slight problems with creasing by the end of the day, but I just freshen it up a bit and it looks great again. Sometimes I’ll even pair this with a more watery concealer for lighter coverage when I need to, which helps with creasing. I pulled this blush back out because I’ve had it for years, but I don’t use cream blushes very often. I’ve always had trouble getting a really natural, even flush with the texture. But when I got the Real Techniques stippling brush, I knew I had the perfect tool to apply this well. Penny Lane is an absolutely beautiful coral-pink with a slight shimmer—perfect for summer! I can’t believe how long this beauty’s been sitting around in my collection. No surprise here. You saw it in my “Colors of the Rainbow” tag, and if you follow me on Instagram, you’ve seen it pop up a few times recently. I used to really like this palette but thought that maybe it wasn’t worth the hype, but lately I’ve realized why it’s such an amazing product. The range of this palette is so versatile, and there is a good enough mix of tones that the options are truly endless. This mascara took some practice because of the shape and texture of the brush, but it has a cult following for a reason. I’m amazed at how much it fans out my lashes and holds a curl, and it still looks flawless at the end of the day! A few months ago, I was wearing it and my boyfriend told me my lashes looked good. I mean, if a man is able to notice how good my lashes look with this on, it’s a winner to me! Before this month, I was spending so much time experimenting with other mascaras lately that I forgot how much I love this one. I also mentioned this lipstick in my “Colors of the Rainbow” tag. I love this color because it’s a super wearable way to get a berry lip. These lipsticks tend to go on sheer, but that works for this color. I’ve been reaching for it any day I’m headed to work and want more than a typical neutral lip. This brush is technically for eyeshadows, but I’ve found that it’s way too big to use on the lid. Instead I use it to set my concealer, and it’s absolutely perfect for the job. I just get some powder on it and tap it under my eyes after I’ve put on concealer, and it looks great. And since the brush is tapered, it’s easy to get into the corners, too. I’ve been using this brush with a matte brown shadow to fill in my brows and set my Anastasia Brow Whiz. The shape of this is SO much better for getting around the arch of the brow and into the narrow parts, so I’ve condemned my flat angle brushes to eyeliner and just use this for my brows.